The Dow Jones Industrial Average is making big gains following the release of better-than-expected consumer confidence numbers, up 0.91% to 15,443 points as of 1:25 p.m. EDT. The S&P 500 is up 0.85% to 1,664. There were two U.S. economic releases today. 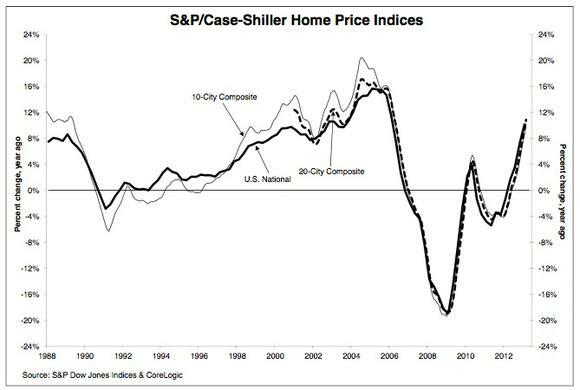 The key report here is the Consumer Confidence Index; rising home prices in March are no surprise. The Conference Board reported that consumer confidence rose to 76.2, its highest level in nearly five years. Analysts were expecting a rise to just 72.3. Consumer confidence had been weighed down by the fiscal cliff, the increase in the payroll tax, and sequestration. Confidence is rising as the economy powers through the obstacles and the stock market and home prices rise. The Case-Shiller composite 20-home price index rose 1.4% in March for an annual rise of 10.9%. The Case-Shiller national home-price index was also up big, having risen 10.2% over the past 12 months. The rise in home prices is the fastest since mid-2006. The rise in home prices is being spurred on by low housing inventory levels and low interest rates. Nationally, home prices are now back to 2003 levels. Today's Dow leader is UnitedHealth , up 2.1% today and up almost 17% for the year as it looks to be a likely beneficiary of ObamaCare. UnitedHealth is now catching the eye of dividend investors, with a sky-high 95% annual dividend growth rate over the past three years. Dividend investors also like that the health care giant only pays out roughly 20% of its earnings, meaning that the dividend has room to grow. Second for the Dow today is Cisco , up 2%. Cisco was last week's third-worst-performing Dow stock, losing 2.9% in reaction to the 15% it gained the previous week when it reported better-than-expected first-quarter earnings. While there's no news today to explain the stock's gains, there's a lot to like about the stock, including a low valuation, a 2.9% dividend, and more than $6 per share of net cash. Once a highflying tech darling, Cisco is now on the radar of value-oriented dividend-lovers. Get the lowdown on the routing juggernaut in The Motley Fool's premium report. Click here now to get started. Third for the Dow today is American Express , up 1.5%. American Express was the Dow's third-best stock last week, up 2.7%. American Express has risen 33% this year as the economy has strengthened. Unlike competitors Visa and MasterCard, American Express is not just a payment-processor. American Express extends credit, so as consumers spend more and default less often on their credit cards, the company benefits doubly. The article 3 Stocks Leading the Dow's Triple-Digit Charge originally appeared on Fool.com. Dan Dzombakcan be found on Twitter @DanDzombakor on his Facebook page,DanDzombak. He owns shares of Cisco Systems. The Motley Fool recommends American Express, Cisco Systems, and UnitedHealth Group. Try any of our Foolish newsletter services free for 30 days. We Fools may not all hold the same opinions, but we all believe that considering a diverse range of insights makes us better investors. The Motley Fool has a disclosure policy.